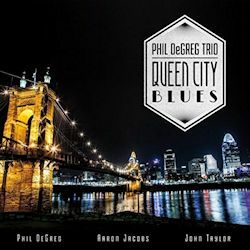 Cincinnati is the ‘Queen City’ of the album’s title and Phil DeGreg is its hometown musical poet in this twelve-track disc. Despite having lived elsewhere in his life, he taught for many years at College-Conservatory of Music in the city whilst also being a club house pianist. With him he has his decade-long trio of Aaron Jacobs and John Taylor. A third of the tunes are the pianist’s own compositions, there are two Gershwins, single examples from the pens of Kern, Rogers, Noble, Jobim and Victor Young, and a much more recent piece by Steve Swallow. It makes for a well-balanced selection. The pianist’s Westside Getaway is the opener – a title redolent of Boogie breakdowns and Basie swingers – and it introduces the trio’s easy interplay, the keyboard fluency of the leader, rock steady bass work, with room for a solo, and increasingly insistent percussive contributions. The stately opening and close of Embraceable You houses some jaunty tempo changes and good solos. There’s a pleasing original in the shape of Fountain on a Square, and it incorporates a good sequence of breaks for the trio, and then there’s a deft version of I’ve Got a Crush on You to follow with its rolling rhythms, trills and faintly Erroll Garneresque sense of vitality. It’s the spirit of someone like Horace Silver that seems to inhabit the title track, with its Blue Note ethos and funky salute to the city. There’s an attractive arrangement of All The Things You Are, which includes a kind of brief quasi-fugato though the composer’s own Five for All is perhaps more redolent of club performances with its breezy, confident feel. My Foolish Heart is the sole true ballad here, suffused with rich, even ardent chording, and good bass and drum support – never intrusive but invariably supportive. Jobim’s Favela allows stylistic expansion to include Latino vibes, and here the exchange quotient is high. My Romance is another standard taken up-tempo and is a good example of the album’s qualities in general: hard-working, articulate trio playing.